Ecologists are making increasing use of computer methods in analyzing ecological data on plant and animal communities. Ecological problems naturally involve numerous variables and numerous individuals or samples. Multivariate techniques permit the summary of large, complex sets of data and provide the means to tackle many problems that cannot be investigated experimentally because of practical restraints. Ecologists are thus enabled to group similar species and similar sample sites together, and to generate hypotheses about environmental and historical factors that affect the communities. This timely book presents a full critical description of three methodologies - direct gradient analysis, ordination, and classification - from both theoretical and practical viewpoints. Both traditional and new methods are presented. 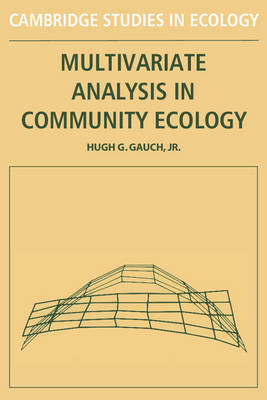 Using a wide range of illustrative examples, Hugh Gauch provides an up-to-date synthesis of this field, which will be of interest to advanced students and ecologists. These mathematical tools are also used in a wide variety of other areas, from natural resource management and agronomy to the social and political sciences.